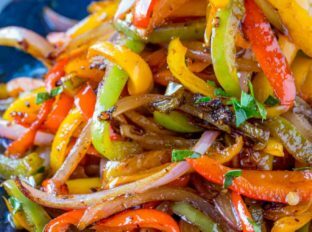 Easy Fajita Vegetables made in the cast iron skillet with a homemade Mexican Seasoning in just 15 minutes. 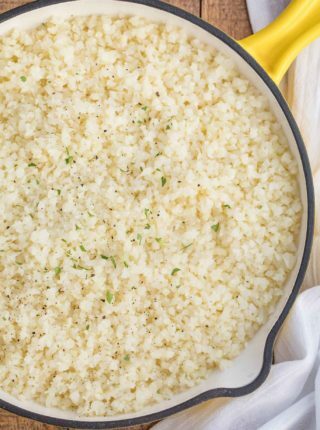 The perfect fiber rich side dish for your favorite fajita recipes. 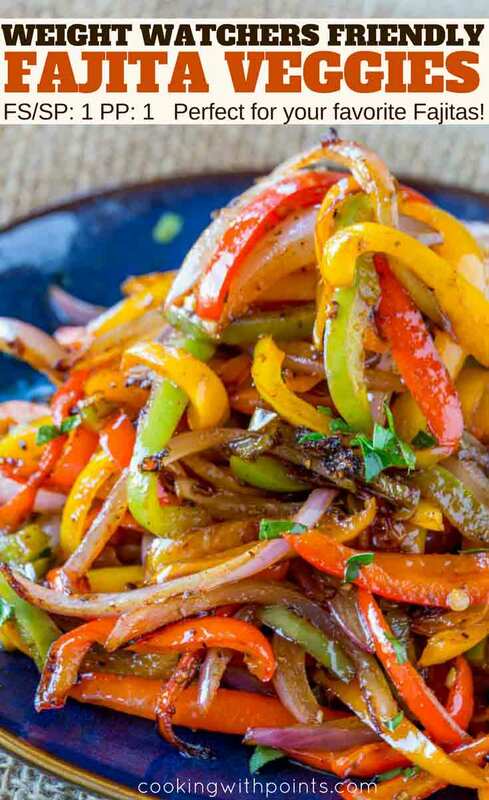 Serve these fajita veggies along with your favorite recipes like Skinny Carne Asada, Mexican Shrimp Burrito Bowl, Chili Honey Lime Shrimp or Honey Chili Salmon Bake. They’re the perfect, colorful side dish! 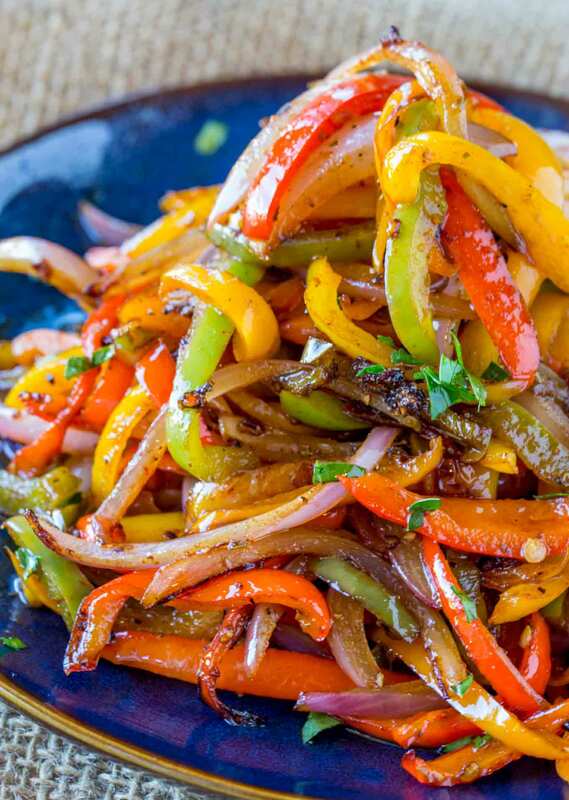 Fajita Vegetables are a quick and easy side dish we make with all of our latin themed recipes. With tender crisp vegetables and lean proteins you can add a lot of flavor, crunch (those red onions even pop with crisp and juicy textures). Every weekend we work with base recipes around here to prepare for the upcoming week. I roast vegetables, grill vegetables (if the weather permits) and cook off a bunch of them in the cast iron skillet to bulk up our meals throughout the week. 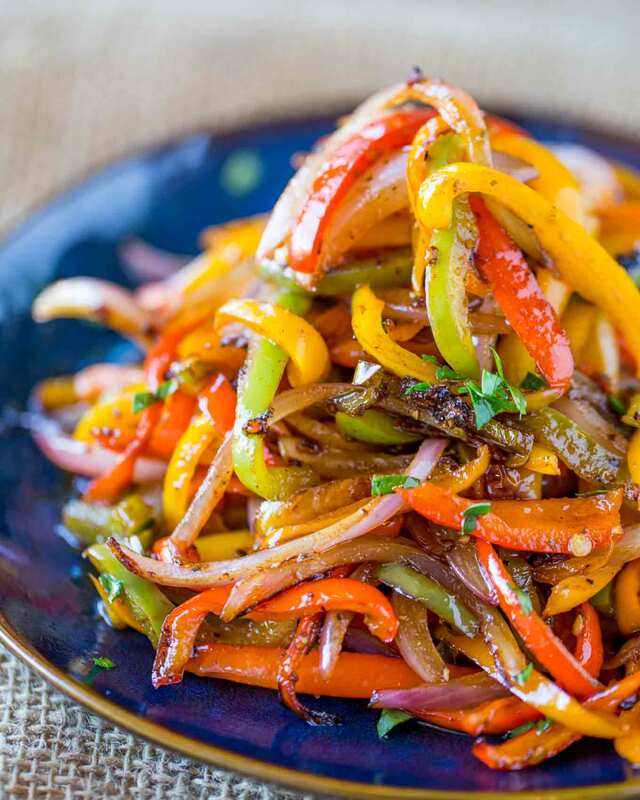 These fajita vegetables are an easy prep recipe because the peppers and onions taste great even when made ahead of time and we end up using them throughout the whole week for breakfast, lunch and dinner. 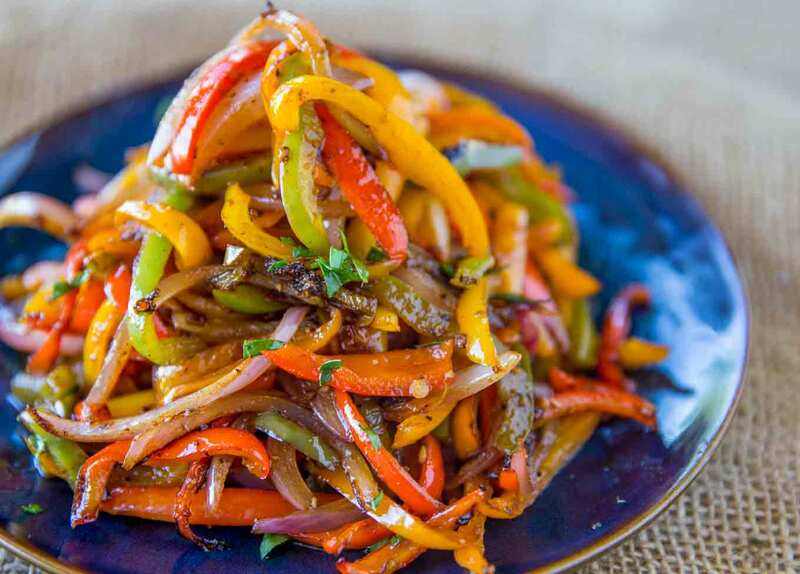 Yes, the mini bell peppers are going to be marginally more work to prep and slightly more expensive, but if you’re hosting a dinner these fajita veggies will look and taste fantastic served along side them. Your favorite fajitas, burritos, burrito bowls, tacos, nachos, quesadillas or taco salads. Omelets, chilaquiles, breakfast scramble plates and any other breakfast favorites. Seasoned pasta recipes like taco pasta or even cajun pasta recipes. The classic way is to use a cast iron skillet or griddle to sear the vegetables quickly while keeping them tender-crisp. You can also roast them off on a sheet pan at 400 degrees for 18-20 minutes or use a grill pan on your grill to cook them over medium heat. Add the canola oil to a cast iron skillet on high heat. Add the vegetables and garlic and let cook for 3 minutes before stirring, then an additional 2 minutes. 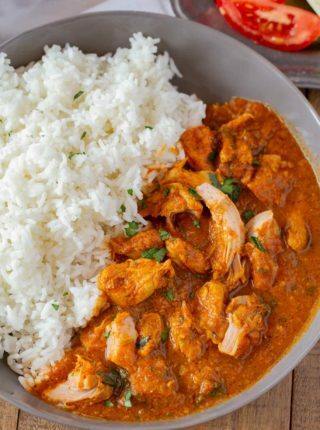 Remove from the heat and serve with your favorite latin foods. Love the tip of using the mini bell peppers! 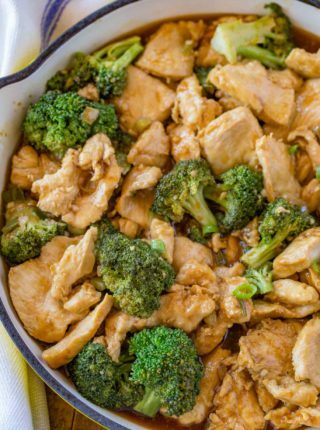 I make these all the time for dinner! It’s so good! These look so good! Love all those veggies! Such a gorgeous side! 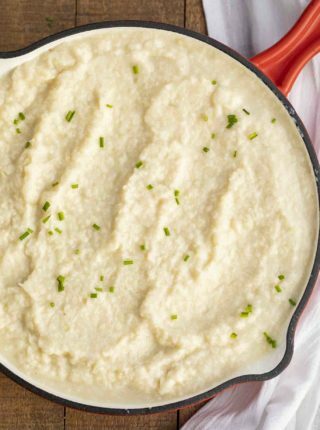 Like you say, so many great ways to incorporate these veggies into other dishes. So pretty, too!